The Destini 125 will mark Hero MotoCorp's debut in the highly-competitive 125cc scooter segment in India. In a bid to expand its scooter portfolio and customer base in India, Hero MotoCorp has announced the launch date of its new offering, the Destini 125 scooter. To be launched on October 22nd, this model will mark Hero MotoCorp's entry into the 125cc scooter segment which has been dominated so far by competitors like Honda and TVS. While the Destini 125 had already been showcased at the 2018 Auto Expo, it was then christened as the Duet 125. 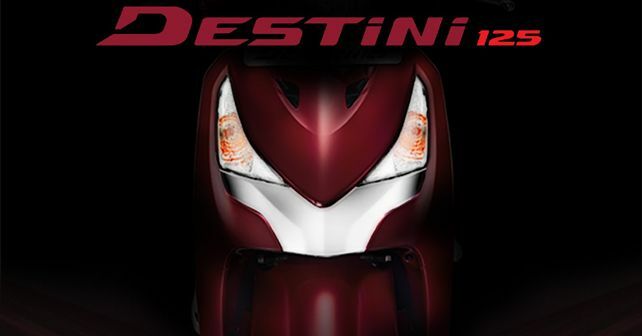 However, for the production-spec model, the name has been changed to Destini 125. While Hero has not revealed many details about its new offering, it may come fitted with features such as optional front disc brake, Integrated Braking System (IBS), side stand indicator, service reminder, pass switch and external fuel filling, to name a few. The Destini 125 is also likely to be the first Hero scooter to get the idle-start-stop-system (i3S system). Once launched, the Hero Destini 125 will be going up against the likes of the Honda Grazia, Suzuki Access 125, Honda Activa 125 along with the TVS NTorq 125, Vespa VX and Aprilia SR 125. To further reinforce its 125cc scooter family, Hero MotoCorp is expected to launch the Maestro Edge 125 as well before the end of this calendar year. The Maestro Edge 125 had also made its public debut at the 2018 Auto Expo.